Welcome everyone to the first in our four part series featuring the seminal document, Acting on Climate Change Solutions from Canadian Scholars, led by Dr. Catherine Potvin from McGill University. Our discussion today is called the Art of the Possible, featuring the ten key recommendations from 60+ Canadian scholars. Before we begin, could I ask each of you to briefly introduce yourselves? Hello, my name is John Robinson, and I am a professor at UBC. I have been involved in climate change research and policy issues since the early 1990’s and was a Lead Author of the Intergovernmental Panel on Climate Change (IPCC) from 1993-2007. I believe that it is very important to frame climate change in the context of attempts to achieve broader sustainable futures. My name is Liat Margolis and I am Assistant Professor of Landscape Architecture at the University of Toronto, Faculty of Architecture, Landscape, and Design. My primary interests are green building technologies, landscapes and ecosystem services, aka green infrastructure, and the design of sustainable cities. I am the Director of the Green Roof Innovation Testing Laboratory (GRIT Lab), an interdisciplinary and applied research facility that is dedicated to testing and evaluating the environmental performance of green building technologies, such as green roofs, green walls, and green roof integrated solar photovoltaic systems. Our research team focuses on analyzing the environmental performance metrics of green building technologies in relation to urban water management, thermal cooling, energy production, as well as biodiversity and habitat creation. We work collaboratively with the City of Toronto Environment & Energy Division, and with over a dozen industry partners, ranging from the roofing and solar industries to irrigation, plant nurseries, and soil manufacturers, building engineers and construction companies. Hello, I'm Catherine Potvin, Biology professor at McGill University. My long-time interests are land use and climate change. Welcome everyone. I am looking forward to our discussion. Let's move to our first question. Catherine, you led this extraordinary group of 60+ scientists, can you explain about the steps you took to get the consensus document, Acting on Climate Change solutions from Canadian scholars? The process involved four steps. First we identified scholars from all 10 provinces, from a mixture of fields relevant to climate change - from economy and engineering to philosophy and sociology - that also represented a gender and age balance. Once that group was identified, the second step was to use a Delphi survey to get the scholars to make proposals related to our original question: what are the 10 recommendations we should bring forward to the government to inform their climate policy? We ran three rounds of the Delphi survey to zoom in on a consensus, which identified six axes of importance. Our third step was to have drafting groups, divided according to specialization, write a first text. About thirty scholars did this. Lastly, we brought all the pieces of text together and sent them to the other half of the network who were not draft authors, as well as to external reviewers, to review the working paper. Their comments were then integrated into the final version. John, George and Lliat, do you have anything to add about the project? What about your results--did you hit any press, what other activites did you take to make sure your document was read, and Catherine? The process has mobilized a community of scholars across Canada, which is itself a very useful thing, I think. I have also been impressed by the amount of press coverage that it received. We got good press coverage here in BC. The release was covered on the front page of the Vancouver Sun, and 3 of the authors also penned an op-ed for the Sun that you can view here http://www.vancouversun.com/technology/ ... story.html. We had a homemade media strategy, taking advantage of everyone's media contacts (like Aerin, who helped a lot). Mostly we started to contact the media as of Sept 2014, so way before to build relationships with journalists. Then we had a series of seminars across Canada from Vancouver to St John's. To get buy-in from the political world, we met with the government of Quebec, with the NDP, federal and liberals in fall 2014 and we invited the governments of all provinces, and of Vancouver, Calgary, Toronto and Montreal to attend the launch. So they all knew we existed way before we launched in March. And then we also had a social media strategy that we are working on now, including this e-Dialogue, and we are hoping to have a big endorsement event on June 5th for World Environment Day. In my more hopeful moments, I think the degree of attention the report received may indicate a broader audience for real climate action than one might assume looking at the official federal position on climate change. In parallel, we also worked on a special issue with Alternatives Journal - http://www.alternativesjournal.ca/magaz ... bility-411. The issue was launched in Toronto as part of the Green Living Show. Thanks, Liat, I forgot about the special issue, and many of you have been presenting at workshops and conferences across the country. I am very impressed by your communications strategy, and Aerin, who is in the e-audience, please jump in with any other comments. Let's move to our next question, if I may. The first key recommendation is putting a price on carbon. There are ten recommendations, can each of you tell me what your top priority is and why? And then perhaps give me your next two after everyone has answered with their first? A price on carbon is my top priority to reach emission reduction targets and a transition to renewable energy; without it we would not be able to unlock the creative potential of the market. To me, the most important action governments can take with regard to climate change is to put a price on carbon. Such a policy has the potential to have significant impacts on carbon emissions, as we have seen in BC. 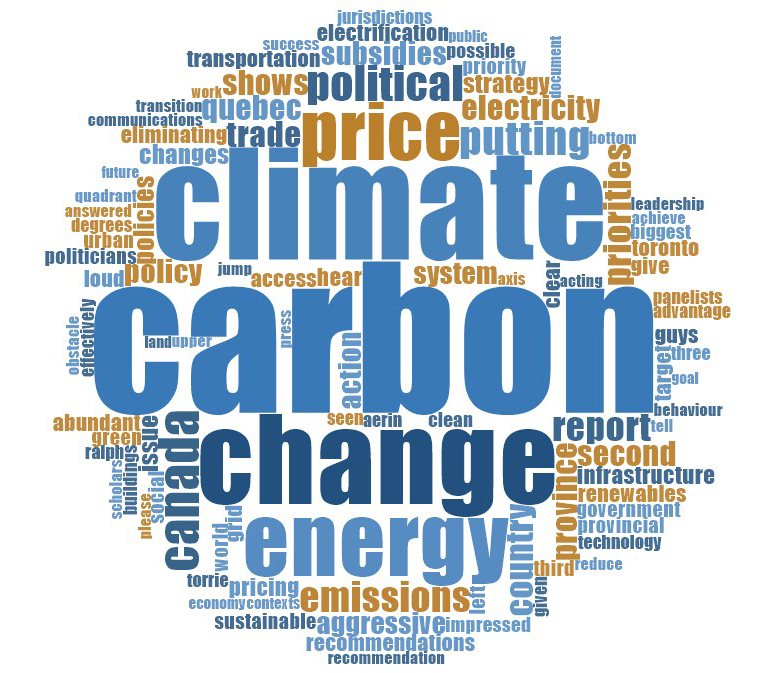 But carbon pricing needs to have three key attributes for it to work effectively. First the price has to be high enough to create change in carbon emitting and energy-using behaviour. Second, the price should rise over time, and this increase must be known in advance to allow changes in investment and purchasing decisions to be made in anticipation of such increases. And third, it must cover a significant fraction of carbon-emitting behaviour. A national downstream carbon tax on all fuel consumption starting at $25/tonne, and increasing by $5/year would be a good start. Policy orientation #6 (integrate landscape, land use, transportation and energy infrastructure planning at multiple scales) is also critically important, I believe. I fully agree with John about policy orientation #6. Urban regions have a huge impact on energy use and emissions. Buildings alone represent 11.4% of GHG emissions, while transportation accounts for 23.6%. For ON, I think that Policy #5 is absolutely critical - a transition to low-carbon transportation strategies. Most immediately, incentives to transition to electrical vehicles play a key role. In fact, Canada’s three largest cities, Toronto, Montreal and Vancouver, have some of the lowest carbon emissions from electricity generation in the world. Taking advantage of this threshold to electrify urban transport can be key to a low-carbon pathway. I'm a huge supporter of an economy-wide price on carbon, so that's my top priority. And you can see how it is place up front in the report - that's an indication of its foundational importance. Putting a price on carbon is critical because, if done properly, it can send powerful signals that reshape incentives and behaviour throughout the economy. Next I would say aggressive low carbon electricity targets, as well as strong energy efficiency policies are critical. The research we have on pathways to decarbonisation show that you need to combine aggressive energy efficiency with rapid decarbonisation of the electricity system, and then electrification of the energy system. For me, it is to remove subsidies on fossil fuels. Along with the price on carbon, those are the basic building blocks of a climate plan. However, in terms of marketing the action plan, what works the best is the clean energy map and the 100% low-carbon electricity in 2035. People are thrilled about that - it changes the mood from punishment to opportunity. And I just read in the Guardian that fossil fuel companies are subsidized to what amounts to $10m a minute, stated in a recent report from the IMF. This is a serious barrier to climate innovations, is it not? Is a carbon tax better than a cap and trade system? And could you talk a little about BC's success with their carbon tax? That's a big question! The SCD report deliberately did not take a position on this. Both approaches can be effective, but they have different risks and benefits. With cap and trade, your outcome is more certain, but you introduce carbon price volatility and some administrative hassles of ensuring trading and offsets are legit. With a carbon tax, you get price certainty (something very important to companies and other large organizations) but you lose a bit of certainty on what you emissions will be. So it really depends on whether you are more concerned about certainty of price or certainty of quantity. BC has been quite successful with a carbon tax. Quebec and California are working together effectively with cap and trade, and Ontario has recently said they will join in. While a carbon tax and cap-and-trade both put a price on carbon and should both induce similar effects for a given price level, I much prefer a carbon tax. It is much easier to administer, and much less susceptible to "gaming" by the industry. It can also be implemented in a revenue neutral way, as in BC, which makes it very hard to remove in the future. And I agree with George that it will be interesting to see how the various provincial plans work out. The most important thing is to get some form of carbon pricing in place. If cap-and-trade is possible in some jurisdiction, and carbon taxes are not, let's go with cap-and-trade. George, both Ontario and Quebec have elected to go with a cap and trade system, would you care to comment? I find that extremely exciting! We're in a fascinating phase of subnational innovation. But it's creates problems in coordinating Canada nationally. There are certain benefits to a nationwide approach that we discuss in the report. Liat, what are the barriers to entry to see transformation of the transportation sector and what do you think of Tesla's new battery storage capabilities? I would say four things, one is the low cost of fossil fuel and along with it a strong lobby from the car and oil industries. Secondly, the lack of electric infrastructure and perhaps easy solutions (i.e. battery exchange service stations vs. battery charging stations). Thirdly, financial incentives for individuals to purchase electric vehicles. And finally, a lack of extensive and diverse public transit options. What we really noticed with our report is that articulating around the innovation potential, the growth of new technologies, associated it renewable energies, was giving the politicians the sort of argument that they wanted to move forward. So, I hear loud and clear, that putting a price on carbon and eliminating all oil and gas subsidies are key, then moving to electrification of the grid, and there is a wonderful map of Canada in the report that shows our country's access to abundant renewables. You guys make it seem like a cake walk? Ann, you left out #6: integrated landscape, land use, transportation and energy infrastructure planning at multiple scales. This is my #2. My profound apologies, it seems to me that the ten recommendations all somewhat integrated, they represent a suite of actions that can and should be taken now if we are serious about moving to a carbon neutral economy by 2050. As George rightly points out there are social and institutional challenges that also need to be addressed, but there are lessons to be learned from BC's climate innovations in local municipalities, see http://www.mc-3.ca, for example, as well as many wonderful international examples. Call me a Pollyanna, however, I believe we are hitting key tipping points, the agreement between China and the United States to name only one. Another tipping point, even The Economist has been repeatedly calling for an end to oil and gas subsidies. Re tipping points: I had been expecting very negative comments in my email after going public. Instead I am receiving messages that largely hinge around "thank you for giving me hope and showing me a way forward". The amount of support we've seen suggests that in public perception there are many people ready to move. I think that the chief obstacle is that politicians do not believe that the public will support strong climate policy. If they think they will be punished at the ballot box for taking significant action, then they will not do so. The success and relative political invisibility of the BC carbon tax shows that taking significant action on climate was not politically toxic in BC, but politicians in other jurisdictions, who are otherwise supportive of climate action, don’t seem to feel that the BC circumstances could be replicated elsewhere. No cake walk. While we're confident the transition is technologically feasible and economically affordable, it does confront significant social and political obstacles. It's not going to be a cake walk, but it's going to be a major change in the society, as George pointed out. However, this can be perceived as something really positive, and facing the impact of climate change if nothing is done will also be very challenging and will bring a lot of sorrow. In Quebec, we have gone through major social changes - we call it the Quiet Revolution - in which we nationalized electricity and created a major dam at the time when the technology did not even exist at the beginning. So what is important is to instil back dreams and courage to Canadians so that they are uplifted rather than pulled down. Robinson and I wrote in 1995, that we have the technology, we have enough information, we know enough science to act now, well we know even more now, it is more than possible, but we will need unprecedented government leadership and I think Acting on Climate Change should be a key issue in the upcoming federal election and any provincial elections. Wynne, for example, has just made a major sustainable infrastructure announcement, is this even just about climate change, isn't it about our country's competitive advantage, its role in international markets as the rest of the world moves to adopt aggressive climate change targets? With Switzerland officially committing to 50% reduction in emissions in 15 years (2030) it is indeed about our competitive advantage. I agree with George and, given the current federal government, I think we need to look to our provinces and cities to lead the charge at the moment. Another obstacle is ideological. Some on both sides of the political spectrum, especially in North America, think climate change is a Trojan horse for a strong leftist ideological agenda. If climate change is seen as a purely partisan political issue in this way, it will be very hard to make progress. A third obstacle is institutional. Energy and carbon intensive practices are deeply and pervasively rooted in almost everything we do. Transforming to a low carbon society and economy will mean deep changes in all the rules that govern how we operate: job descriptions, performance evaluation criteria, codes of practice, regulatory requirements, urban form, land use, transportation infrastructure, energy and water systems, patterns of production, and consumption behaviour, will all need to change. Getting the policies right is crucial but insufficient. We need to dig deeper. And this in turn may require us to rethink deeply held beliefs about nature, humanity, knowledge and meaning. The good news is that such deep-seated changes have happened before (e.g. the emergence of modern science, the industrial revolution), so we know they are possible. We concur about the ideological obstacle. Normand and I wrote about climate change becoming something left-wing as scary. There is quite a large literature on the political psychology of climate change now in the literature. Check out the works of Yale's Dan Kahane. Or another useful intro is George Marshall's book "Don't Even Think about It"
Thanks, George, another great book, recommended by Ralph Torrie, who is in the e-audience, is by Anders Hayden. When Green Growth is not Enough. Climate Change, Ecological Modernization, and Sufficiency. We have quite an esteemed e-audience and a lively discussion happening there. Our climate change research in BC, is looking at changing/transforming current development paths. Ralph Torrie stated in the e-audience, "this is why we have to get out of the energy/climate box to solve the problem". I think we have to get energy right first, but many of you have expertise in sustainability, would you care to comment, will be get there if we reduce our emissions to a 2 degree change only, is even that sufficient. www.climatenalytics.org argues that it should be lower, 1.5 degrees, that the 'guardrail' concept of 2 degrees although considered safe, is inadequate and therefore be better seen as an upper limit? I think I am an outlier on this, but I don't think these temperature boundaries are the overriding issue. Climate change is a phenomenon deeply rooted in the institutional, social, cultural, religious and political fabric of our world. It cannot be effectively addressed if we don't recognize the intertwined set of other problems (militarism, neoliberal dogma, cultural, ethnic and religious strife, extreme inequity, etc.) that both are part of the causes of climate change, and also necessarily part of whatever solutions we try to adopt. We can't achieve our climate goals unless we learn how to create inherently low emission future development paths. I believe that is another way of saying that we can't effectively address climate change unless we work towards a fully sustainable future. Single metric indicators cannot be the overriding target, though they can be useful signals of individual aspects of the problems we face. John raises an incredibly important point, and one that is related to Naomi Klein's important new book "This Changes Everything"
It is very challenging figuring out where in the complex system of relations we should intervene. My own personal philosophy is to do what I can to keep the broader sustainability transformation in mind, but focus on how to leverage change as quickly as possible on the climate system. I fear that focuses too much on the complex relations among components of the system will breed paralysis. George, a good point, I was being deliberatively provocative. As Katherine pointed out, other jurisdictions are being far more aggressive than Canada. That moves us nicely to our next question. Given each of your provincial contexts, BC and Quebec, what do you think are the priorities for your respective province? In addition, retrofitting of the large number of 1950-1970 buildings to be more energy efficient is key. In Toronto alone, ther are over 1500 aging buildings that are energy hogs. Re-skinning buildings could achieve a 40-50% reduction in heating and cooling. Also, emphasis on the protection and improvement of urban forests and ecological zones are important for both mitigation (i.e. thermal cooling) and resilience to flooding, maintaining biodiversity, pollinator species and so on. For example, TD economists recently determined that the Toronto urban forest delivers almost $80 million worth of benefits annually, ranging from storm water control to energy savings to cleaning polluted air. Liat, you remind me of the many many smaller steps that can be taken, we are capable now of net zero buildings and indeed carbon restorative buildings, simply retrofitting existing building stock would do so much to reduce GHG emissions while at the same time reducing the costs of energy. And of course, as you point out, the health dis-benefits from not acting now. This really emphasizes John Robinson's ideas on regenerative sustainability that we adopted in the last chapter of the report. BC has ambitious energy efficiency policies in the electricity sector, requiring that BC Hydro meet 2/3rds of additional demand with demand side-management. While remaining committed to that goal, the province is not quite on pace to meet it yet. I think it is safe to say that BC is the leader in the country, I don't know whether or not Catherine would agree from Quebec's perspective, and it has reduced its GHG emissions while keeping pace with the rest of the country's GDP, and its public sector organizations achieved carbon neutrality by 2012. We as researchers need to give more evidence of the co-benefits of acting in one space, having many unintended and intended benefits in others. We think that there are three provinces currently leading: BC, Quebec and Ontario. The single biggest reduction for any province in GHG reductions is Ontario, because it closed its coal plant. And Quebec exceeded its Kyoto target, which ended in 2012. The main challenge now in Quebec, because we have 100% low-carbon electricity, is to have an integrated transportation strategy that would allow us to reduce further our emissions. The emissions per capita in Canada is ~20 tonnes/yr/person. In Quebec it is ~11-12, and in Montreal it is ~7. A comment from Ralph Torrie in the e-audience, for all to reply. It raises what all of you have touched on throughout our conversation, perhaps the biggest elephant in the room, political will. "If you imagine a quadrant in which the H-axis is political feasibility and the v-axis goes from high to low carbon (bottom to top), the policies and strategies we need are in the upper right quadrant. The carbon tax, cap and trade, eff reg etc. are all in the bottom left". This is a good way of putting the question, because what it does is show that the biggest challenge is political feasibility. We're not going to find a magic bullet of something that drives decarbonization but is politically simple (although the Breakthrough Institute and others like Piehlke advocated R&D as best approach). What we need to do is transform politics so that the solutions that are politically challenging now become possible. That conclusion has been a core part of the reason why I, as an academic concerned about climate action, have moved increasingly into political activism. I think this is the biggest strength of our report: to give a positive spin on climate change. Rather than emphasizing carbon pricing at the forefront, we are putting the unused potential of clean energy - which can lead to business innovation, green employment, new technology - at the forefront. And clearly this is what the politicians are grasping and why we have had such a good pick up. We were asked by a politician how to sell carbon pricing in a campaign and my answer was you don't sell carbon pricing, you sell "let's take advantage of our clean energy to move Canada forward". I agree this is a well-considered focus on the message of the SCD report and very well done and helpful. I have found in my own work that switching the message from the sustainability of limits and constraints, according to which almost all human activity is harmful, to a regenerative sustainability approach, in which we search from forms of human activity that simultaneously improve human and environmental wellbeing, engenders an extremely positive response. Not all activities can be regenerative in this way, but it is always better to do them than harm reduction, where they can be found. Thank you, one and all, both the e-panel and e-audience discussions were very lively, and we are still experimenting with this platform, having more interaction between both forums. Are there any last comments before we end our discussion? Please refer to the SCD documents that are hyperlinked on the webpage announcing this conversation, as well, the February edition of Alternatives magazine, features articles from several of us, and these ten action steps are doable and should be implemented now. Are they perfect, no human agenda for change is, but they are a necessary and critical first step to moving this country forward. As I heard from young people last week, let our politicians be big and bold. Thank you so much, Ann, for organizing this. Thanks for organizing this, Ann. It was a lot of fun. This is a wonderful forum. Thank you Ann and Chris for moderating and facilitating the discussion.